Animal Wildlife | Horn Shark | The horn shark is a small species of shark, natively found in the coastal waters of north-west North America. The horn shark is named for the broad, flattened head and high ridge found behind this shark's large eyes that is almost horn-like in appearance and makes this shark one of the hardiest of all shark species. 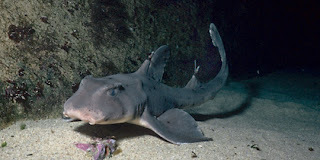 The horn shark is endemic to the Pacific north-east, and is only found in the warmer waters off the coast of California. The horn shark is most commonly found along the temperate to sub-tropical continental shelves where it spends most of it's time in search of hard-shelled marine organisms to eat off the sea-bed. The horn shark is a small species of shark that typically measures about 1 meter in length. 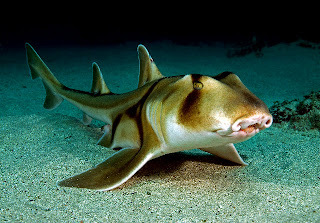 The horn shark can be most easily recognized by a short, blunt head with ridges over its eyes and two high dorsal fins with large venomous spines. The horn shark is usually a brown or grey colour with many small dark spots across it's body. The horn shark is a clumsy swimmer that prefers to use its flexible, muscular pectoral fins to push itself along the bottom of the ocean rather than swimming through it. The horn shark is usually solitary, though small groups have been recorded (particularly during the mating season). During the day, horn sharks rest motionless, hidden inside caves or crevices, or within thick mats of algae, though they remain relatively alert and will swim away quickly if disturbed. After dusk, they roam actively above the reef in search of food. Horn sharks are carnivorous predators and although they do eat fish and marine invertebrates on the ocean floor, around 95% of the horn shark's diet is made up of hard-shelled molluscs and crustaceans which they horn shark uses its short, hardened head to break them apart before eating the fleshy insides. 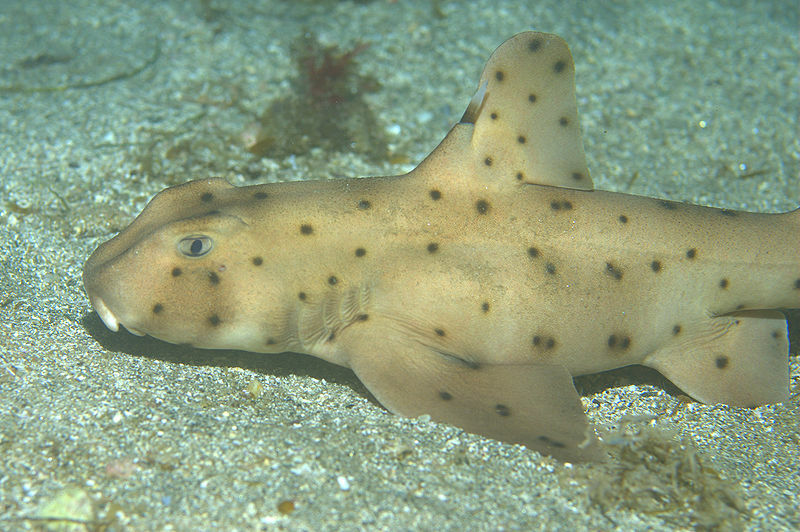 Horn sharks also feed on echinoderms such as sea urchins and star fish. Despite being quite complex predators themselves, the relatively small size of the horn shark means that they are by no means at the top of the food chain within their natural environment. Large species of fish prey on the horn shark along with other sharks that share their native range. 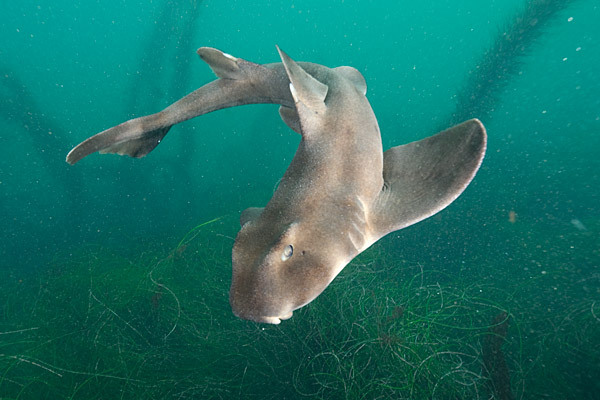 Humans are also one of the horn shark biggest threat as although they are not really hunted, horn sharks are often caught as by-catch when we are fishing for other things. 0 Response to "Horn Shark"